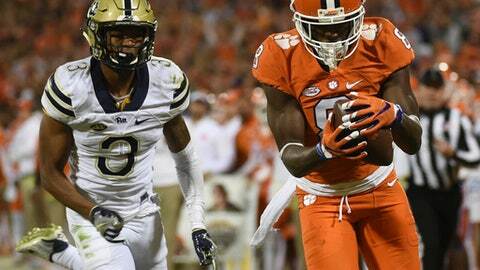 Note: The first in a series of stories with Clemson receiver Deon Cain as the AP follows his journey to the NFL draft. Deon Cain knows the questions are coming and he is looking forward to answering them this week at the NFL scouting combine. Cain played three seasons at Clemson and was productive receiver for a team that made three playoff appearances and played in two national championship games. Cain played in only one of those national championship games. After the regular season of his freshman year, he was suspended for the College Football Playoff by Tigers coach Dabo Swinney for failing a drug test for marijuana. For the last six weeks, Cain has been training at the Exos performance center in Phoenix. He has added about 10 pounds of lean muscle to his 6-foot-1 frame, thanks to a high protein diet. He believes he could run a sub-4.4-second 40-yard dash after all the speed work he did at Exos. But none of that will likely be as important as how he answers questions from NFL executives and coaches in Indianapolis about that suspension. Cain is projected to be a second-day selection during the NFL’s three-day draft, which starts April 26. Bleacher Report draft analyst Matt Miller said Cain currently has a solid round-two grade. Dane Brugler from NFL Draft Scout.com said he had Cain going in round three. Lance Zierlein of NFL.com gives Cain a second-round projection and compares him to former Atlanta Falcons receiver Roddy White, who made the Pro Bowl four times in an 11-year career. A five-star prospect out of Tampa Bay Technical High School in Florida when he came to Clemson, Cain enrolled early with an eye toward graduating in three years. He had 34 catches for 582 yards and five touchdowns in 13 games as a freshman, helping the Tigers overcome the loss of star receiver Mike Williams to injury in the season opener. Two days before Clemson played Oklahoma in the College Football Playoff semifinal at the Orange Bowl, he was sent home for violating team rules. He had failed a drug test. Cain stewed watching Clemson lose the national championship game in Arizona to Alabama. He fumed over Swinney’s decision to suspend him. He considered transferring. Cain’s mother, Celia Thompson, was not having that. Cain stuck it out. The suspension went through the spring and he had to take part in a three-month treatment program. Cain was reinstated May 2016. That season he caught 38 passes for 724 yards (19.1 per catch) and nine touchdowns. The Tigers went back the national championship game for a rematch against Alabama, this time in Cain’s hometown of Tampa at Raymond James Stadium. ”Just walking in that stadium, it was like a dream come true,” he said. And the Tigers won the national championship. Cain put in one more solid season, with 58 catches for 734 yards and six touchdowns while Clemson broke in new starting quarterback Kelly Bryant. Having earned a degree in communications, Cain left his last year of eligibility behind. At Exos, Cain upped his weight to between 205 and 208 pounds. And he thinks he can blow up the 40 on Saturday, when the receivers do on-field drills at Lucas Oil Stadium. ”I definitely want to run a good 40, low 4.3s, 4.2s,” Cain said. That kind of speed is rare and could make Cain a first-rounder – as long as he can convince teams his troubles are in the past. He is as confident he could do that as he is in his speed. ”I still just want to thank God that he put me through those trials to get me where I am right,” he said.